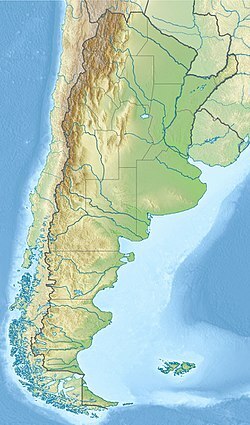 The Cerro Barcino Formation (also known as the Gorro Frigio Formation) is a geological formation in South America whose strata span the Early Cretaceous. The top age for the formation has been estimated to be Albian. Earlier estimates placed the formation until the Campanian. The formation was deposited in the Cañadón Asfalto Basin, a rift basin that started forming in the earliest Jurassic. Dinosaur remains are among the fossils that have been recovered from the formation. The Cerro Barcino Formation is the second-youngest unit of the Chubut Group, which also includes the older Los Adobes Formation. Both formations cover a vast area in Chubut Province, Argentina. The two formations are distinguished by geological features suggesting a distinct change in climate, from a wetter, flood plain environment in the Los Adobes to a much more arid, desert-like environment in the Cerro Barcino. The final three members were estimated to range from Albian to Campanian age (112 to 83 million years ago), while the La Paloma dates to the latest Hauterivian (130 Ma). Indeterminate abelisaurid remains. Possible indeterminate carcharodontosaurid remains. Indeterminate Titanosauria remains. Also, an unnamed titanosauriform. Chubutisaurus C. insignis Bayo Overo "[Two] partial skeletons including most limb elements and caudal vertebrae." A titanosaur. Figari, Eduardo G.; Roberto A. Scasso; Rubén N. Cúneo, and Ignacio Escapa. 2015. Estratigrafía y evolución geológica de la Cuenca de Cañadón Asfalto, Provincia del Chubut, Argentina. Latin American Journal of Sedimentology and Basin Analysis 22. 135–169. Accessed 2018-09-10. Rauhut, O.W.M. 2004. Provenance and anatomy of Genyodectes serus, a large-toothed ceratosaur (Dinosauria: Theropoda) from Patagonia. Journal of Vertebrate Paleontology 24. 894–902. Accessed 2019-04-06. This page was last edited on 6 April 2019, at 18:56 (UTC).